You are currently browsing the archives for the Horseshoes category. Before the turn of the 20th Century in the days referred to as the “Old West”, money was hard to come by. People used common items for everyday use. The horse was an essential part of everyday life. 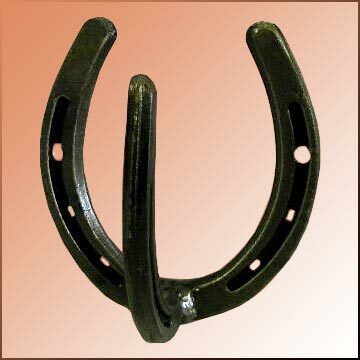 Horseshoes were fashioned by local blacksmiths and farriers. Once worn out, they became useful objects to fashion Horseshoe Wall Hooks and other home decor. A bit of nostalgia still exists for the days when hard work and craftsmanship was a staple for creating goods of pride and value. A touch of the “Old West” is still available and popular today with useful, handcrafted horseshoe creations. Even though a Western Blacksmith’s work was never done, downtimes sometimes called for a little creative departure from the norm. Blacksmiths thought up creative uses for horseshoes that were a bit different than just shoeing horses. From designing coat racks to building household decor, one use was creating mind challenging Horseshoe Puzzles. From Double Horseshoe puzzles, the idea for a Triple Horseshoe was formulated. These are fun to play with, and create a great piece of coffee table trivia. If you know somebody that’s recently moved into a new home, it’s perfect timing, because summer is finally upon us. This means that by the time they are unpacked and ready to host a housewarming party, it’s sure to be sunny and clear weather. This is ideal for hosting an outdoor BBQ or potlatch style dinner. 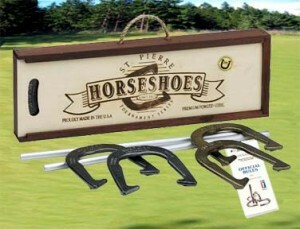 If you’re looking for a fun and unique housewarming gift, consider buying them a horseshoe game set. Especially if they have children, this will be a fun and wholesome way for those kids to enjoy their summer vacation outside. And if the day does turn out to be sunny, the horseshoe game can be brought out immediately and used to entertain all the guests. Don’t Get Bent Out of Shape over Damaged Horseshoe Stakes! After several years of playing horseshoes, it’s very likely that your stakes have seen better days. After all, they have to withstand a lot of dings and nicks as well as frequent relocations. All of these activities can leave the stakes looking a bit bent out of shape, literally! But you don’t have to buy an entirely new horseshoe set just because your stakes are looking a little haggard. Rather, just look into replacement horseshoe stakes. This way, you only have to spend a little bit of money rather than shelling out for an entirely new set. It also cuts down on unnecessary waste, since your horseshoes are likely still in good working order. For summer fun, don’t forget that the game of horseshoes is a great option for the whole family. Horseshoes is an ideal game for two or more people. 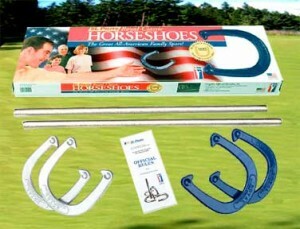 The only equipment that’s required in a horseshoe game is four horseshoes, one stake, and a little bit of room. After that’s acquired, each person takes turns throwing his or her horseshoe. The goal is to come as close to the stake as possible. Point scoring differs slightly between amateur and professional play, but generally it is three points for a ringer (when a horseshoe encircles the stake) and one point for coming closest to the stake. In amateur play, a leaner (when a horseshoe literally leans on the stake) is worth two. In professional play, this is often considered one point. If both parties throw a ringer, they generally cancel out. That is, each player does not score three points. Play can go to any agreed upon number, but the most common benchmark is twenty-one. A player must win by two. Players are only awarded points if a horseshoe is within six inches of the stake. But again, these rules are often altered or tweaked to accommodate games that are just for fun. If you’ve ever been exposed to horses, you’ve probably seen horseshoes, or u-shaped metal items fitted onto a horse’s foot. And if you’ve spent any significant amount of time around horses, you might have even seen these horseshoes being fitted onto a horse. A professional horseshoer is known as a farrier, and they fit these shoes by nailing or gluing them into or onto the horse’s hooves. But don’t worry animal lovers. If done correctly, you don’t need to fret about damage or pain to the horse. The horseshoe is nailed through the hoof wall, which is an insensitive part of the hoof roughly equivalent to a human nail. When this area is trimmed, it can be understood as a kind of manicure for the horse. 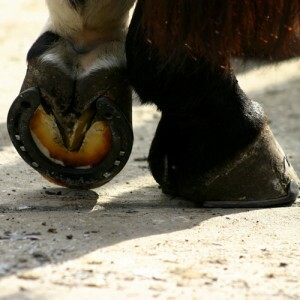 Many farriers believe horseshoes protect horses from wear and tear on their hooves. There are also a group of farriers, however, who believe that having a horse unshoed, for at least part of the year, can be beneficial to the horse.